From 2006: Billy calls out #GeorgeW's fear mongering. Eleven years ago, I thought George W. was a huge fear monger. Donald Trump has him beat for most cowardly liar. Barbie has TOTALLY figured out #DonaldTrump! 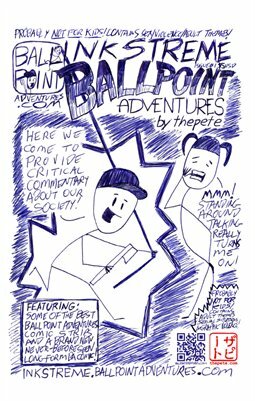 ...and then go download the first digital BALLPOINT ADVENTURES mini-comic right now! For FREE! Just go here to get the 12-panel PDF: http://finetip.ballpointadventures.com! Feel free to let me know what you think of it by commenting below or hit me up on Twitter (@thepete)! From 2006: Barbie let's #fear manipulate her once again! Eleven years after I drew this comic we can clearly see that fear mongering by jerky white guys in the White House is nothing new. Yes, I know Billy spelled Al Qaeda wrong. Sometimes I experimented with the idea that I would make these characters flawed by intentionally leaving in a mistake. Not sure it ever helped make anything more funny or more effective commentary. Support: Patreon or coffee or just follow me on Twitter. Barbie has serious issues with @realDonaldTrump, but he knows the truth! You know that this is just the beginning, too. Less than a month in and Trump and his lackeys have already started spreading the idea that his word is unassailable. File this one under "the tip of the iceberg." From 2006: Billy hates Apologists! With all the rewriting of reality lately, this strip seems pretty topical.